oh, this pretty cat and Zac reminds me of…. Yeah the paperwall is so late 70s. I used to have that kind of pattern on the kitchen’s floor. reminds you of what Rumi??? 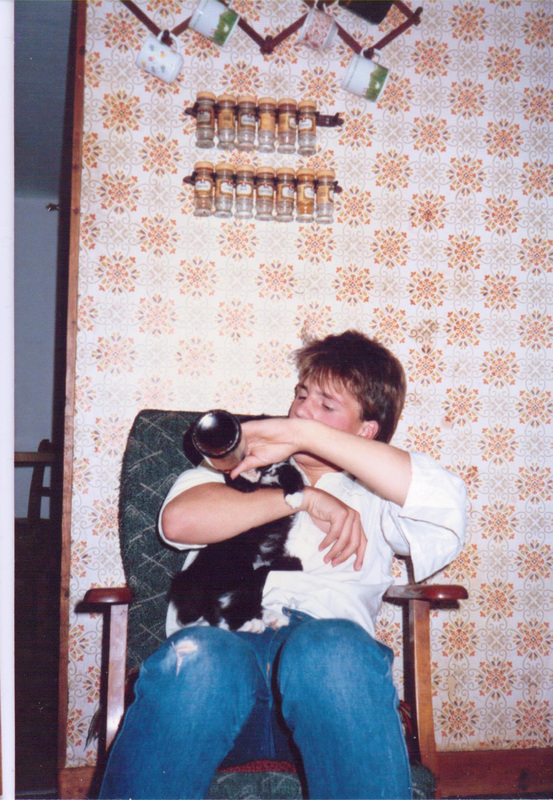 oh, once I saw the article on NME that he was interviewed in his house, there his cat he said he loves, and that cat (I don’t remember she or he… ) was just like this cat with young Zac. yes, I knew that, I’ve heard the story before and felt so sad. I made a bit confusion here, this pretty cat and the cat living with him in London (NME article) not the same cat. I meant to say two of cats were black and white, quite resemble. Hey there! Great photo. That is so sad to hear about your lovely cat : ( That must have been tough! It’s so funny when i see the spice rack in the kitchen. It really brings me back to our kitchen in the late 70’s too what with the spices and the wall paper. Hillarious!!! It’s good to see Zac liked animals. I always think that shows a sensitive side to people which is a good thing. I’m sure he wouldn’t mind you putting the pic on the website at all. Poor little cat. At least she or he’s been happy in Foley’s family and Zac arms (really lucky) til the end. Thanks Anne Marie for sharing some part of your family life. For Rumi… if you find that article in NME about Zac… feel free to post it here, cause I would like to read it. Teenage years!!! Probably Zac used to be ashame of those days. Of course I don’t understand cause he’s cute, even with that mullet.